Dec 29, 2013; Oakland, CA, USA; Denver Broncos offensive coordinator Adam Gase during the game against the Oakland Raiders at O.co Coliseum. The Broncos won 34-14. Adam Gase has informed the Browns "Thanks, but no thanks" according to several national reports Tuesday morning, including Mike Klis of the Denver Post. Gase declined to be interviewed earlier for the Browns job and said he wanted to wait until after the Broncos were out of the playoffs. The Browns would not be able to interview him until after the Super Bowl on Feb. 2. Meanwhile, Seahawks defensive coordinator Dan Quinn and Bills defensive coordinator Mike Pettine are believed to be the leading candidates to land the job. Quinn is expected to meet with the Browns for a second interview this week. Since he met with them before, he is permitted to have a second interview despite the Seahawks playing in the Super Bowl. Pettine also is expected to get a second interview this week. 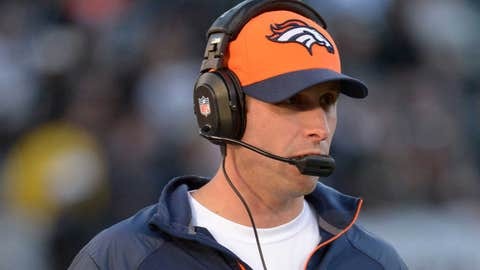 Gase would be the third potential candidate to withdraw from the Browns search with the other two being Patriots offensive coordinator Josh McDaniels and Cardinals defensive coordinator Todd Bowles. Other coaches still available that the Browns are known to have interviewed are Mike Munchak and Rich Bisaccia.